The Problem-Solving Project is a participatory music theater program designed to teach problem solving and social action skills. The participants interact with the program's characters and each other to resolve personal and social issues. 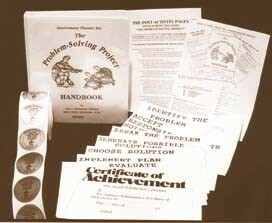 Programs are 45-75 minutes long, followed by an informational meeting with a staff member on using the FREE Problem-Solving Project Handbook and other materials. Programs are designed to teach and entertain all ages from grades PreK through 12 in any setting or location.